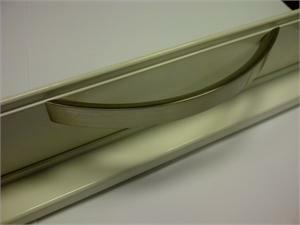 This new curved handle (BS010H1) replaces the old chrome D handle (BS010H0) on all shutters, manufactured from Monday 11th February. This new handle is wider and deeper than the previous handle to improve the products looks and feel during operation but this means it cannot be used as a direct replacement for the chrome D handle. In October last year SWS advised its customers of a change to the bottom slat lock that they used in commercial shutters and manual garage doors. They will soon be sending details out to customers about an update to the bottom slat lock arrangement used on their range of aluminium shutter which will be taking place later this month.